October is Bullying Prevention Month. Bullying can be extremely damaging and unfortunately, children and teens with disabilities and other special needs are more likely to be victims of bullying behaviors than their typically-developing peers. Many students with disabilities are doubly impacted by academic struggles and social challenges. When children are bullied, their education can suffer even more. Bullying is not a harmless rite of childhood that everyone experiences. Research shows that bullying can negatively impact a child’s access to education and lead to school avoidance and higher rates of absenteeism, decreases in grades, inability to concentrate, loss of interest in academic achievement, and increases in dropout rates (PACER Center). In addition, bullying has negative and often long-term impact on victims and aggressors alike (Wolke et al., 2013). October presents an opportunity for schools and communities to learn more about the causes of bullying, collect and examine information about any bullying that is occuring, and make policy and practice changes to protect all children and youth. Youth, parents and caregivers are invited to a free transition workshop. More information HERE. We welcome foster, adoptive and kinship families for some movie fun on October 14 from 7 - 9:30 PM in Fairfax. Children and youth enjoy their own G-rated movie. In the room next door, parents and caregivers are invited to watch some adoption, foster care, and kinship care-related media and join in a relaxed evening discussion. Snacks served! We will only hold the event if we get enough interest by October 7- please RSVP. Q: Our foster daughter is just starting high school. She has been diagnosed with PTSD and anxiety and we believe the conditions make it harder for her at school. Her therapist recommended we have her assessed at school so she can get special education and the supports she needs at school, but the school says she's not eligible for services because she has passing grades. Is that true? A: In short, no! This is a complicated area of policy and practice and of course, every child's situation is unique. The Individuals with Disabiltiies Education Act (IDEA) that guides provision of special education and related services addresses this in the section on free, appropriate public education (FAPE). The definition of FAPE in the Virginia regulation at 8VAC20-81-100 clarifies that FAPE is available to children with disabilities including those in need of special education "even though they have not failed or been retained in a course or grade and are advancing from grade to grade..."
Supplementary information to the federal 2006 IDEA regulations clarified that "The group determining the eligibility of a child for special education and related services must make an indivdual determination as to whether, notwithstanding the child's progress in a course or grade, he or she needs, or continues to need, special education and related services." (Fed Reg 8/14/06. pg. 46580). Recent amendments in 2008 to the Americans with Disabilities Act (ADA) broadened the interpretation of the terms that define disability, making it clearer that conditions like ADHD can be covered. In addition, the amendments clarified that mitigating measures shall not be considered in determining whether an individual has a disability. Mitigating measures include, for example, medications, coping strategies, and adaptive neurological modifications that an individual could use to eliminate or reduce the effects of an impairment. So, treatment for a mental health or other condition would not preclude a student from receiving protections and supports as a person with a disability under ADA and Section 504 of the Rehabilitation Act. Learn more about the ADA Amendments generally HERE and about application of Section 504 and ADA Amendments on students with ADHD HERE. The Updated Formed Families Resource Directory is available now. Download yours! Don't be shocked by all the free and low-cost training events available to parents, caregivers and professionals. Treat yourself to some of these great offerings from FFF and friends! 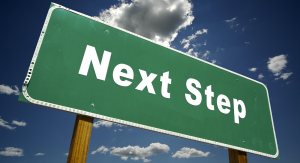 October 3- Taking the Next Step: Transitions through High School and Beyond workshop hosted by FFF, Fairfax. October 4 - 18- Understanding Special Education workshop series, hosted by Prince William County Public Schools Parent Resource Center, Manassas. October 5- The Message of Behavior workshop, hosted by Loudoun County Public Schools Parent Resource Services, Ashburn. October 14- Formed Families Movie night hosted by FFF, Fairfax. October 15- ADHD Connections: A Mind-Body Approach conference, sponsored by the ADHD Resource Group of No Va, Arlington. October 17- Foster/Adoptive Book Club, hosted by Fairfax County Foster Care and Adoption Association, Alexandria. October 20 - Together We Can Stand Up to Bullying workshop, hosted by Fairfax County Public Schools Parent Resource Center, Dunn Loring. October 29- Fairfax County Public Schools Mental Health Wellness Conference, Fairfax High School. November 2- Effective Parenting: Managing Intense Emotions and Problematic Behaviors Skillfully, hosted by Arlington Public Schools Parent Resource Center, Arlington. November 11-13- Project LIFE Statewide Leadership Conference for foster youth, Roanoke. November 19- Kids' Adoption Network conference and carnival, sponsored by C.A.S.E., Chevy Chase. 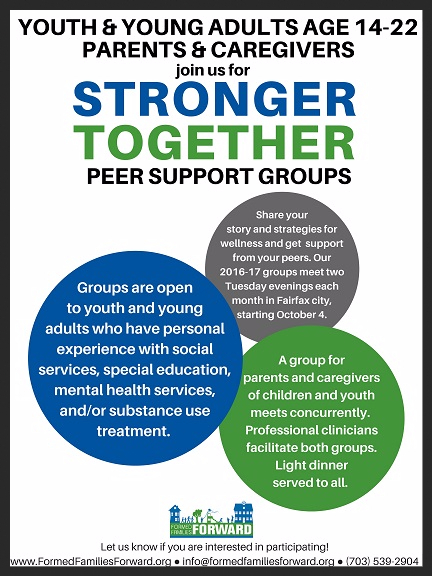 Our Formed Families Forward Stronger Together peer support groups for youth and young adults ages 14-22, and for parents and caregivers, start up again October 4. The facilitated groups meet two Tuesday evenings a month and dinner is provided! Meetings are held in Fairfax. We welcome all youth and young adults who have personal lived experience with social services, special education, mental health services or substance use treatment. Parents and caregivers get their own group as well! Let us know if you are interested; complete the form HERE. We thank NAMI of Virginia and Fairfax County System of Care for their support of the Stronger Together groups. Did you know that Formed Families Forward has a resource webpage devoted to trauma and trauma-informed strategies? Check it out HERE! Among the recent additions is an on-demand 25-minute webinar on Understanding Trauma from the Fairfax County Trauma Informed Community Network. Great for educators, service providers and families alike, the webinar is a quick, convenient way to learn or refresh the basics, as well as introduce others to the fundamentals of trauma and trauma-informed care. Watch it HERE. No scaredy cats! Like us on Facebook and get the latest information just for formed families and professionals who care about special needs, adoption, foster care and kinship care. Great information, but not too much or too often, we promise! Give us a try.